Fair warning: this footage is a little shocking. 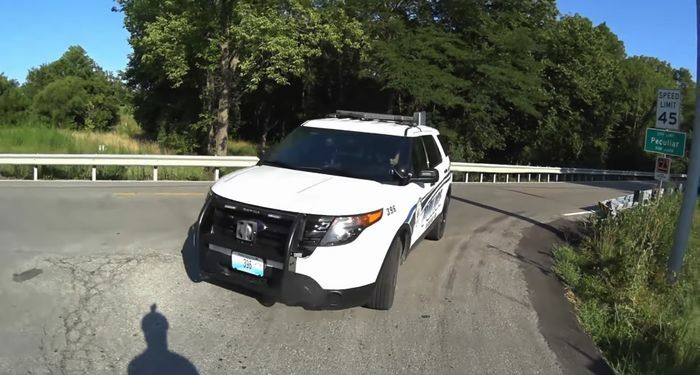 A cyclist out for a ride somewhere in Missouri recorded the moment when a local police officer drove straight into him due to being distracted by a mobile phone. The footage clearly shows the cyclist stop at a T-junction and wait for traffic on the road across his path to disperse. Just as he seems to be making his final checks before setting off, an old-generation Ford Explorer patrol car turns into the junction with the officer behind the wheel looking down at his phone. He crunches straight into the cyclist, who has no time to get out of the way. He immediately calls-in the collision and Missouri state police arrive to take charge. At least the cop did the decent thing; admitted responsibility and removed himself from any conflict of interest. Plenty of police staff might have tried to talk their way out of something like this. Luckily the speeds involved were low. Do your fellow road users a favour next time you take the wheel: leave your phone in your pocket.